Martin County Fair Turns 60 and SHINES! Friday, February 8, 2019: Today marks the opening of the Martin County Fair http://www.martincountyfair.com in Stuart, Florida. It is celebrating 60 shining years featuring our County’s youth, agriculture, arts and community resources. 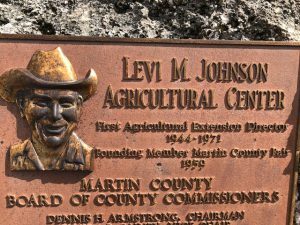 UF/IFAS Extension Agent and County Director Levi M. Johnson (1944 to 1971), was the founder of the Martin County Fair Association. Along with Ed Higbee, Jim Foster, and Pat DiMinico, Johnson encouraged the start of a small carnival in 1959. Consequently, it has bloomed into the Fair we know today. As in many corners of our state, our 4-H youth shine the brightest in the “Youth Livestock Show”. These nightly shows are considered signature events. Leading up to the Fair, the youth care for each animal that they enter. The 4-Hers note feeding, grooming, activity, and many other features of the animal’s health in their Project Books. From steers to swine, rabbits to goats, poultry to guinea pigs, the animals highlight the show. Listen as the 4-Hers proudly describe the care of their entries! Additionally, 4-H youth enter other creative exhibits to show off their growing skills, including arts and crafts and photography. Serving up baked goods or speaking on their favorite topics are popular ways the children participate. Natalie is the 4-H Youth Development Agent in Martin County, Florida. She loves to grow vegetables hydroponically - and create culinary delights with them.